The booty of war has always been a controversial issue in the history of mankind, which continues even today. Kingdoms had invaded other kingdoms, world empires had come and gone, and national treasures had changes possessions. In this article, we will study what the Torah teaches about the laws of warfare and booty of war and how Israel is to wage war against its enemies. The laws of warfare in Deuteronomy 20 have reference to the wars which Israel might wage in future wars against non-Canaanitish nations (Deu_20:15). According to these laws, it as a duty of Israel to spare as much as possible the lives of its own soldiers and also of the captives. If Israel is to go out to battle against its enemies who are more numerous than them, Israel is not be afraid of them for YHVH is with Israel to save his people (Deu 20:1-4). And when Israel conquers the land, then they are to make a call for peace. And if the call for peace is accepted, then all the people are to be spared and used as compulsory laborers. However, if the inhabitants of the land do not accept peace with Israel, then YHVH will give them into the hands of the Israelites to destroy every male that can wage war (Deu 20:10-13). This is the law of what is to be done to the lands that are far from Israel. So, in the entire chapter 20 of Deuteronomy, Israel was instructed how to conduct warfare with the enemies that were far off, that is the lands that YHVH had not given them to possess. Israel was commanded to offer peace. If the peace would be accepted, then the captives were to be treated and serve as prisoners of war. If not, however, then the enemies were to be destroyed, because they dared to attack Israel in the first place. This is in contrast with the warfare that was to be conducted with the Canaanites, whose land YHVH had given them for an inheritance. In the cities of the Canaanites, no soul was to be left alive, and the reason for such a ruthless war was given: so that the Israelites might not learn from their abominations and sins. We should note that the law of warfare of Israel does not say ‘Go out to war”, but “If you go out to war”. “If you go out to war” here is referring to an optional war, i.e., non-obligatory war, since in reference to the obligatory war to conquer the land of Canaanites, it would be unlawful to say “and you take captives” because it has already been stated, regarding the seven nations of Canaan, that from these peoples no soul is to be left alive (Deu 20:16). The reason being for the obligatory wars against the Amalekites and their descendants is that they showed no mercy to women, children, old and sick at the rear of the camp, when Israel was going out of Egypt. As for the Canaanites, the laws to destroy anyone of them were given, because they were the most evil of the evil heathens. They were the ones whom Yehoshua (Joshua) did not destroy completely and left them among Israel, from whom the Israelites learned how to worship their idols, temple prostitution, burning their children alive to Moloch (Lev_18:21, 2Ki_23:10, Eze_16:21, Jer_7:31). This was commanded, that the Israelites might not suffer themselves to be led astray by such an alliance, to go a whoring after their gods, and sacrifice to them, to take part in their sacrificial festivals, or to marry their sons to the daughters of the Canaanites. Because Elohim of Israel had determined to destroy them when the measure of their iniquity was full (Gen_15:16, Lev_20:23). As the Israelites were warned against idolatry in Deu_6:14, so were they commanded to beware of the false tolerance of sparing the Canaanites and enduring their idolatry. When YHVH drove out the Canaanites before the Israelites, and gave them up to them and smote them, they were to put them under the ban (see Lev_27:28), to make no treaty with them, and to contract no marriage with them. Therefore, what is said in Deuteronomy 20 does not apply to the offensive wars with the Canaanites and Amalekites, about whom it is said to be destroyed, but to the defensive wars which Israel would carry on with the neighboring nations after the conquest of Canaan. The command, “Do so to all the cities which are very far from you, which are not of the cities of these nations.” (Deu 20:15) refers to the neighbors of Israel (“the cities far from you”) which are not of “these nations”, that is the Canaanites. In this context, we should not here that YHVH has not given the lands of the other nations in possession of Israel, therefore, the only way the laws of warfare in Deuteronomy 20 is to be understood as laws of defensive wars which Israel may be forced into, if attacked (see again “If you go out to war”). This if-clause supposes an optional and defensive war versus the mandatory offensive war against the Canaanites and Amalekites where no such an option can be found. Whether an offensive or defensive war Israel is to conduct, the laws of warfare includes law regarding the booty of war which Israel may capture. The Israelites were commanded what to do with any booty of war they might capture from their enemies, such as that which Avraham their father captured. We find these laws in Numbers 31, the war against the Midianites. A few things should be noted here. YHVH commanded Israel to count up the plunder, that is the booty of war, and to divided it into two parts between the soldiers and the civilian population. They were also to set aside a levy, or contribution, to YHVH who had given them the victory. This levy was also to be divided into two parts in the same way the booty of war, and to be given to the Levites. And Mosheh and Elazar the priest did as YHVH commanded. And the booty of war was: 675,000 sheep, (Num 31:32), 72,000 cattle (Num 31:33), 61,000 donkeys (Num 31:34), and 31,000 captives of women who had not known a man (Num 31:35). And the half, the portion for the soldiers, was 337,500 sheep (Num 31:36) and the levy to YHVH of the sheep was 675 (Num 31:37). The cattle were 36,000, of which the levy to YHVH was 72 (Num 31:38). The donkeys were 30,500, of which the levy to YHVH was 62 (Num 31:39). And the captives were 16,000, of which the levy to YHVH was 32 (Num 31:40). So Mosheh gave the levy which was the contribution to YHVH to Elazar the priest. The half belonging to the people was 337,500 sheep (Num 31:43). 36,000 cattle (Num 31:44), 30,500 donkeys (Num 31:45), and 16,000 captives (Num 31:46). Then Mosheh took from the children of Israel half: one out of every fifty, drawn from man and beast, and gave them to the Levites (Num 31:47). And Mosheh and Elazar the priest received the gold from them, which was 16,750 shekels (Num 31:51-52). And Mosheh and Elazar the priest received the gold from the commanders and brought it into the Tent of Appointment as a remembrance for the children of Israel before YHVH (Num 31:53-54). When the Israelites obtained the booty of war from the Midianites, the priests received 1/500th of the goods from those who had gone to war—not 1/10th as the law of the tithe would require (Num_31:27-29). The Levites received more booty of war—1/50th of the congregation’s half of the spoil (Num_31:30). The division of the booty of war into two equal halves, one of which was given to the soldiers and the other to the people that had taken no part in the war, was perfectly reasonable and just. The 12,000 soldiers (a thousand from each tribe of all the tribes of Israel) had had all the hardships and dangers of the war and rightfully deserved a greater part of the booty of war for their service. That greater part of the booty was granted to them by receiving quite as much as the whole of the nation, but being only a small portion of it (only 12,000). Also, because the warriors only gave 0.002 percent of their share as a thanksgiving offering (the levy to YHVH) for the victory versus 2 percent for those who remained at home, their booty of war was much increased. These laws of warfare and booty of war are made as laws for all times. Per them Israel can and must defend its land from a foreign aggression. It is a lawful and moral to obtain booty of war in a defensive war, and it has become a rule that those who go to war are to be rewarded much higher than those who remained at home (see Jos_22:8, 1Sa_30:24-25; also see 2 Macc 8:28-30). These are the laws of warfare and booty of war, according to the Torah of YHVH. Now, what can we learn from them? These laws of YHVH, not surprisingly, have become universal laws in all armed forces of the nations, even today: the military personnel receives a larger portion of the national welfare than the civilian population. However, today we witness a double standard of the booty of wars on the international stage. A covetous desire for the possessions of the land of Israel and envy at its exalted position in the center of the world, high living standards, world-class science and technology, are the motives by which the world and more specifically the hostile Arab nations, are impelled to invade it. That envy was behind the aggressive Arab wars against Israel in 1948, 1967, and 1973. In these wars, the State of Israel was justifiable to wage defensive wars against the hostile Arab aggressors and obtain booty of war, as it did. The State of Israel captured vast territories of Egypt, Syria, Jordan, and Gaza. Israel took possession of Jerusalem after thousands of years. In six days in 1967, Israel expanded its territory almost to the boundaries YHVH promised to Avraham. One would think that the defensive war the State of Israel waged against the Arab countries was justifiable, but not. The wicked and hypocritical world denied this sovereign act of defense of Israel. The U.N. Security Council adopted Resolution 242 was as double-minded as it can be possibly be. It failed to address the core reason behind the 1967 6-day, which is: to indicates the aggressor and the victim in this war; neither the aggressive Arab countries nor the victim, the State of Israel, were identified in the resolution. The dubious phrase “the grave situation in the Middle East” did not expose which part of the conflict had caused it. Resolution 242 emphasized “the inadmissibility of the acquisition of territory by war” is if the very members of The U.N. Security Council (all of them without exceptions) had not acquired territories by offensive war before and after 1967. And not only they but all European former colonial powers which still occupy territories far away from the homelands. One thing is for sure, though: if Israel is to return the conquered lands in defensive wars, how much more it is obligatory for all colonial powers to return the lands they occupied in offensive wars. If the State of Israel cannot keep the booty of war, nor can the world powers, unless the world is governed by double standards. The U.N. Security Council adopted Resolution 242 further says that affirms the principles that require the establishment of a just and lasting peace in the Middle East by the withdrawal of Israel armed forces from territories occupied in the aggressive Arab war, and the termination of all claims or hostilities and respect for the sovereignty, territorial integrity and political independence of every State in the area and their right to live in peace within secure and recognized boundaries free from threats or acts of force. In other words, what the hypocritical U.N. Security Council is saying is this: The State of Israel is to return the conquered land and to respect the territorial integrity and the recognized boundaries [before the war] of the Arab countries, as if nothing had happened. No reparations, no repercussions, no condemnations, nothing; not even one resolution of the U.N. Security Council condemning the aggressive Arab wars, not even today. Just the opposite: Israel is blamed for almost everything that could happen in the Middle east. Resolution after resolution condemning the victim and justifying the aggressors, thus inciting even more aggressions. The Mighty One of Israel, the Judge of the world, says thus, “Woe to those who call good evil and evil good”. 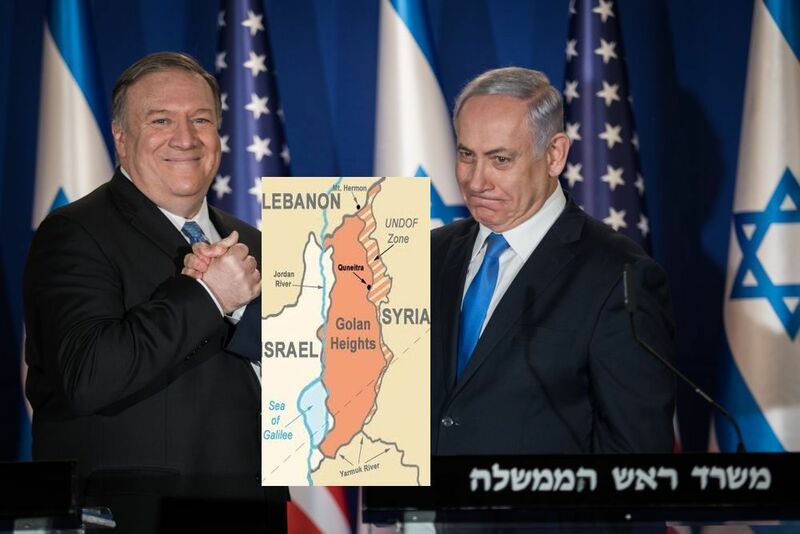 In a historical act of justice, on Thursday, 21 March 2019, the U.S. President Donald Trump declared recognition of Israeli sovereignty over the Golan Heights. The man who upset the whole world with his unprecedented election as President of the United State of America, upset the world once more. President Trump declared what was right thing to declare. President Trump recognized Jerusalem as a capital of the State of Israel and now the Golan Heights, which was once a part of the land of tribes of Gad, Reuven, and half the tribe of Menashsheh. For the excerpt from PM Netanyahu’s Remarks at the joint statements with US Secretary of State Mike Pompeo following President Trump’s Declaration read here, and of the U.S. Department of State read here. In other words, what Obama is saying is that the phenomenon of Israel’s prosperity is the greatest obstacle to negotiations between Palestinians and Israel, thus unknowingly he fulfilled the prediction of the Malbim from the 19th century.